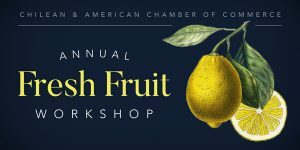 Join colleagues, port representatives, and government officials to participate in an interactive experience reviewing the trade, technical, legal, regulatory and business issues affecting the import of Chilean fresh fruit into the Delaware Valley Region. Senior Director of Trade Services, GEODIS USA, Inc.
For speaking and sponsorship opportunities, please contact Christina Lista at 215-790-3627 or [email protected]. To learn more about the Philadelphia Wholesale Produce Market, click here. 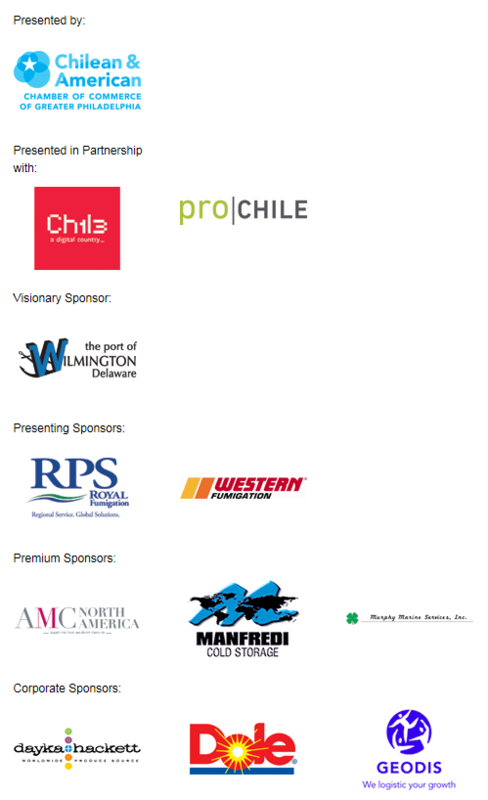 Join the Chilean and American Chamber of Commerce of Greater Philadelphia for its 13th Annual “Experience the Taste of Chile.” Enjoy an evening of authentic Chilean food, wine, rich conversation and celebration of the strong commercial and trade partnership between the Delaware Valley and the Republic of Chile. 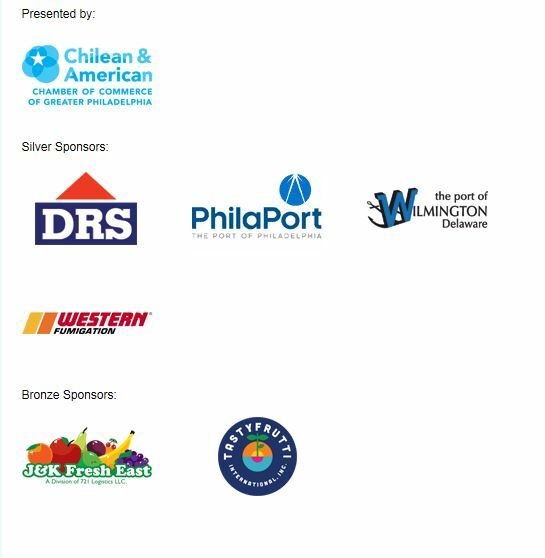 Take advantage of the opportunity to participate in this unique event and show your support for the work the Chamber does to continually strengthen the commercial and business ties between the Greater Philadelphia Region and Chile. For additional sponsorship information, please contact Christina Lista at 215-790-3627 or [email protected]. Cheers to 30 Years will be held at the grandiose Water Works, a National Historic Landmark with breathtaking views of Boat House Row and the Center City skyline from its waterfront location at the foot of the Philadelphia Museum of Art. The cocktail reception will include a 2 hour top-shelf open bar highlighted by Chilean wine and an abundance of passed hors d’oeuvres, a chilled seafood station, an antipasto station, and more. The CACC is tremendously appreciative of all levels of support given for this special cocktail reception. Sponsorships are still available and can be purchased by clicking here. RSVP to [email protected] to register. For more information, contact Christina Lista at 215-790-3627 or [email protected]. 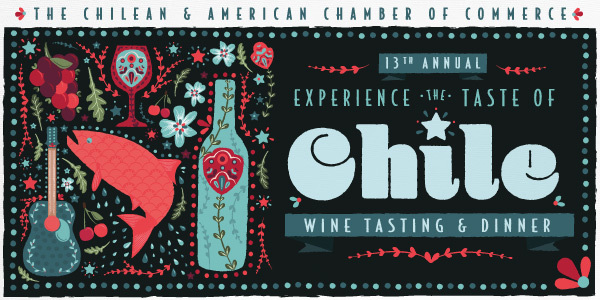 There was a glow emanating from the Du Pont Country Club as stars in the international shipping business and political galaxies gathered for the Seventh Annual “Taste of Chile” Wine Tasting & Dinner, presented by the Chilean & American Chamber of Commerce. 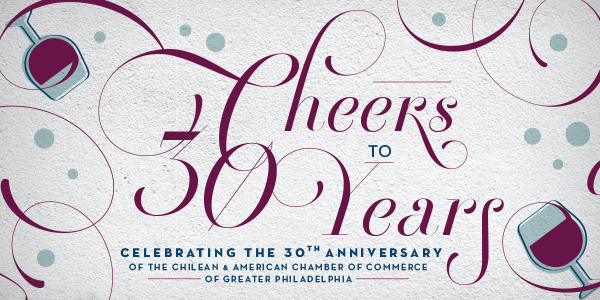 Designed to celebrate the exceptional economic and trade partnership between Chile and the Greater Philadelphia region, the dinner was an elegant, stellar tribute. Delaware’s United States Senator Tom Carper and Governor Jack Markell, joined Chile’s new Ambassador to the United States, His Excellency, Felipe Bulnes in delivering gleaming reports on Chile’s skyrocketing progress. The Chilean economic story is certainly one of the most positive success stories going on in the world today. 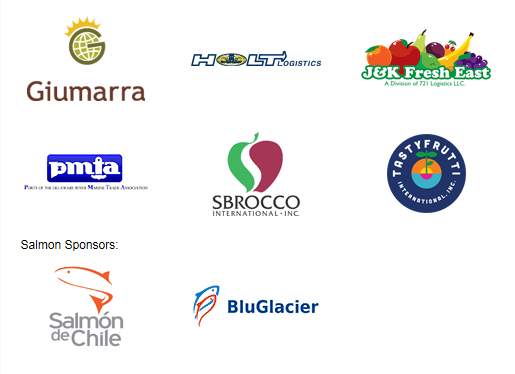 With a tremendous growth trajectory over the last three decades, Chile is now number 17 in the world for food exports. They are rising so swiftly, they’re expected to be among the top ten exporters by 2014. Chilean produce broke the grip of ‘Winter,’ making fruit available to the United States all year-round, while creating thousands of jobs from the Delaware Valley all the way to Santiago. The president of the Chilean & American Chamber of Commerce, Robert Palaima, was the evening’s master of ceremonies and noted the Chamber has been a key factor in bolstering this astounding bilateral trade. In fact since 1989, the total value of Chilean imports coming through the Delaware River ports rose from $192, 020, 000 million to $966,330,000 million dollars. The outstanding imported wines were part of an exquisite dinner made of foods imported from Chile. In addition to the remarkable Tamaya Cabernet Sauvignon and others, there was also delicious AquaChile Verlasso salmon, farm raised in Chile. It was absolutely delightful and is the result of a joint research and development effort between the Du Pont Company of the United States and the Republic of Chile. Ricardo Maldonado, the Executive Director of the Chilean & American Chamber of Commerce said, “It is fitting that the evening’s award is called ‘Visionary’ because in fact, everyone at the dinner has that characteristic in common. All of the national and international companies represented, the workers and staff of the Ports of the Delaware River, the Chilean and American Chamber of Commerce and the government officials of Chile and the United States are all participating in a real-life dream-come-true.” A remarkable story of vision, dedication, partnership and amazing progress. InvestChile from Corfo is pleased to invite you to the 5th International Forum ”Chile: Investment Opportunities for Mining Suppliers” that will be carried out between the 17th and 20th of October 2011. During the event, there will be many local and foreign representatives from markets such as North America, Oceania, Africa, Latin America and Europe, in search of direct or joint investment opportunities in this sector. InvestChile from Corfo is organizing the fifth version of this forum in order to promote the installation of technologically advanced projects in Chile to take advantage of the conditions that the country offers to manufacture, integrate, assemble and provide services to the mining sector. InvestChile is interested in all those companies that intend to invest or that, have a concrete project or are looking for a Chilean counterpart. In order to participate in the forum, all companies must fill a registration form providing details of about the investment project to be developed.